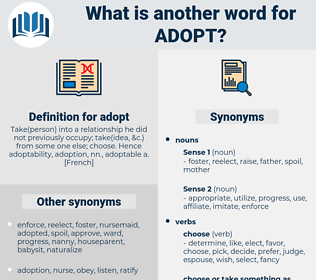 What is another word for adopt? supports, loyalists, needs, items, OKS. accept, are, AM, follow, opt, espouse, decide, engage, rely, catch. accept, tools, Measures, lay, aadopt, follow, opt, impose, accredit, adhere, transpose, countenance, integrate, accommodate, authorise, Chose, espouse, decide, condone, utilize, ratify, acquire, engage, Considering, rubber-stamp, rely, apprehend, tolerate, legislate, occupy, deploy, catch, deliver, emulate. disagree, disown, shun, refuse, deny, repulse, let go, release, disapprove, give, reject, oppose, return, discard, disallow, neglect, renounce, repudiate, leave alone. As for me, I preferred on this occasion to adopt a light disguise. By his wish I am to take you to an old friend of his, with whom you are connected through your mother, who will adopt you and be a father to you. 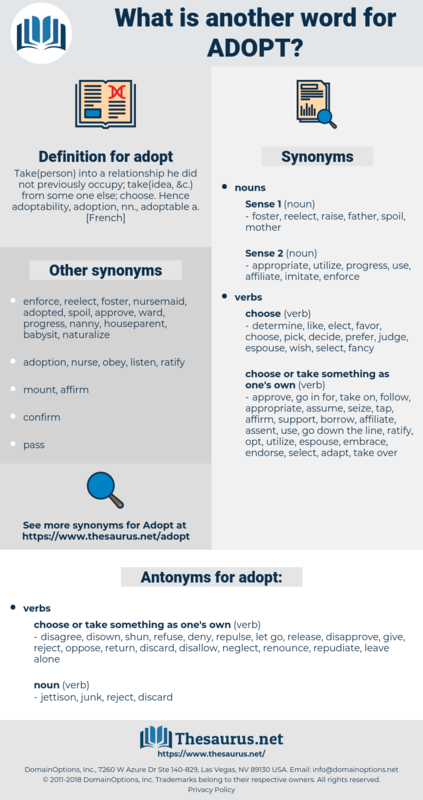 adapt, adept, adoptee, adapid, at-bat, adopted, autophyte, adapted. choose, select, pick out, accept, take, have.